Optus Managed Cloud - Storage is a cloud-based solution that allows you to access enterprise-grade IP addressable storage resources on-demand over a remote network connection, located in secure Optus Data Centre facilities. Enterprise-grade IP addressable storage: giving you your own IP space assigned to your virtual storage array, enabling seamless integration into your own environment. Features and administration tools: including self-service access interface, quotas and snapshot technologies. Service Management and support: provides continued support across Service Desk Requirements (available 24 hours, 7 days per week), Change Management and Service Management Reporting. Reliable, flexible, scalable and cost effective connectivity via Optus Evolve IP VPN, Optus Evolve Ethernet WAN or Optus Uecomm Ethernet. Optus Managed Cloud - Storage carries a minimum commitment charge for 500GB and then utilises a consumption based billing model thereafter. Additional charges apply for any additional service options including Replication and De-duplication. 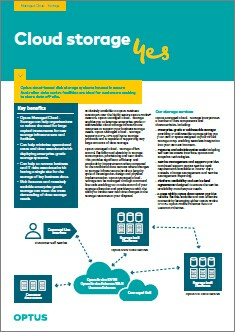 Avoid large capital investments for new storage infrastructure and facilities by leveraging Optus Managed Cloud - Storage. Helps to minimise operational costs and time associated with deploying enterprise-grade storage. Helps to remove business and IT risks associated with having a single site for storage for key business data. Massively scalable enterprise-grade storage on-demand can help organisations who need elasticity in data storage. Leverage Optus Managed Cloud - Storage to create a highly available on-premise and hybrid cloud solution. Optus Managed Cloud - Storage offers control, flexibility and elasticity in storage consumption, provisioning and tear down. Optus Managed Cloud - Storage enables Optus Business customers to leverage enterprise-grade IP addressable Cloud storage infrastructure resources to support your business storage needs. Optus Managed Cloud - Storage supports CIFS, NFS and iSCSI storage protocols and is capable of supporting large amounts of data storage. Virtual Storage array - is assigned to each Customer to store data. The Virtual Storage Array contains one or more Storage Volumes. Storage Volumes - are used to store data and can be a up to 16 Terabytes per Storage Volume. There is a minimum commitment of 500GB required with a maximum of 8 Storage Volumes. Storage Trees - can be created within the Storage Volume and are used to set attributes applicable to the directory structure including the size of the quota attributable to the storage tree in which data can be stored. NFS (Network File System) v3 and v4 allow you to store, update and view files on a remote computer or storage system as though the data was on your own computer storage systems. CIFS (Common Internet File System) provides file based storage to Windows-based clients. Two versions of CIFS are supported including Server Message Blocks Version 1 and 2.
iSCSI LUNS allows you to connect a Optus Managed Cloud - Storage LUN to your server infrastructure with cloud managed services. Optus cloud-based disk storage systems housed in secure Australian data centre facilities. Contact and collaborate with UCaaS - an easy way to deploy a suite of leading collaboration tools to your users. Optus EXPAN NEXTDC provides co-located hosting services for your IT equipment in NextDC data centres. Keep up with one of the fastest growing areas of ICT. Leverage our expert insights and strategy articles to develop your knowledge base.